Every year in the Baltimore Harbor natural and anthropogenic siltation processes infill waterways and navigation channels, necessitating the removal of 1.5 million cubic yards of sediment to keep the port operating. The Design with Dredge research program brings together practitioners, community members, academics, regulatory and policy officials, and industry representatives to advance shared conceptual frameworks, planning priorities, and applied landscape strategies for resilient dredged material management in the Baltimore region. 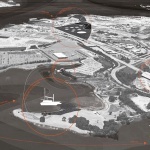 Through cross-disciplinary collaboration, compound research methods, and direct stakeholder engagement the program provides a lens through which to explore emerging and future landscape infrastructure issues facing port cities and coastal communities. It also serves as a medium for material investigation and a cooperative paradigm for engaged civic action. 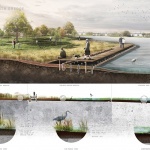 In recasting the clays, silts, sands, and gravels of the Baltimore Harbor as a substrate of resiliency, Design with Dredge is catalyzing the institutional and operational energy and knowledge of diverse stakeholders to reimagine what it means to live in a dynamic urban estuary where legacies of labor, innovation, and ecological justice overlap. ▲改变海岸线：每年有150万立方码的淤积物从巴尔的摩港清除。这些黏土、淤泥、沙子和砾石使该区域的海岸线发生了显著的改变，并将在未来持续发挥作用。Shifting Shorelines. Every year 1.5 million cubic yards of sediment is dredged from the Baltimore Harbor. These clays, silts, sands, and gravels have and continue to be used to dramatically alter shorelines in the region. ▲加深渠道：由于船舶尺寸的不断扩大，巴尔的摩港需要更深的航道才能够安全地运行，因此，渠道中需要被清除的淤积物也越来越多。Deepening Channels. Shipping vessels continue to grow in size, requiring deeper navigation channels to safely call on the Port of Baltimore. As a result, channel dredging displaces increasingly large volumes of sediment. ▲疏浚环路。疏浚的流程包括对从联邦航道中排出的淤积物进行疏通、运输、放置、处理和再利用。该景观基础设施的运作是巴尔的摩-切萨皮克地区淤积物运输的主要驱动因素。The Dredge Cycle. The dredge cycle includes dredging, transportation, placement, processing, and reuse of marine sediment pulled from federal navigation channels. This landscape infrastructural operation is a major driver of sediment transport processes in the Baltimore-Chesapeake Region. ▲景观基础设施：联邦航道的运行和淤积物的运输是港口城市和沿海社区景观基础设施系统的重要组成部分。陆地与海洋的关系变化将为景观基础设施的建设带来机遇和挑战。Landscape Infrastructure. Federal navigation channels and sediment transport processes are integral to the landscape infrastructural systems of port cities and coastal communities. The mediated and continually evolving relationship between land and water, presents opportunities and challenges for adaptation and resilience. ▲区域淤积物管理：巴尔的摩港的水渠系统为整个切萨皮克湾流域的淤积物提供了沉降空间。船舶引起的湍流也会助长淤积物的增加。从水渠收集来的物料会被放置在疏浚物料容纳设施（DMCF）内。Regional Sediment Management. The Port of Baltimore channel system is a sediment sink for sources throughout the Chesapeake Bay watershed. Turbulence from shipping vessels also contributes to sediment accretion. Material dredged from the channel is placed in dredged material containment facilities (DMCF). ▲景观评估要素：疏浚设计研究计划利用景观评估要素来为物料管理提供适应性的框架，将巴尔的摩港的黏土、淤泥、沙子和砾石重新塑造为切萨皮克地区的弹性基础景观。Landscape Criteria. The Design with Dredge program utilizes landscape criteria to guide an adaptive framework for dredged material management that recasts the clays, silts, sands, and gravels of the Baltimore Harbor as a substrate for resiliency in Chesapeake Region. ▲合作式研究：疏浚设计研究计划将相关从业者、社区成员、学者、决策和行政官员以及行业代表汇集起来，共同推进了共享式概念框架的确立、优先事项的规划以及应用景观战略的制定，以便在巴尔的摩实地区实施弹性化的疏浚管理。Collaborative Research. The Design with Dredge program brings together practitioners, community members, academics, regulatory and policy officials, and industry representatives to advance shared conceptual frameworks, planning priorities, and applied landscape strategies for resilient dredged material management in the Baltimore region. ▲复合型研究方法：疏浚设计研究计划部署了多种研究方法，包括地图投影、系统测绘、历史调研、案例研究、类型学研究、适用性建模、材料测试、公众参与以及设计预测等。Compound Research Methods. 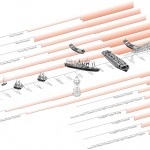 The Design with Dredge program deploys a diverse set of research methods that include cartographic projection, systems mapping, historical investigation, case studies, typology studies, suitability modeling, material testing, participatory action, and design projection. ▲案例研究：记录最新疏浚物料管理实践的国家及地方案例为研究跨学科的创造性思维指明了方向。Case Studies. Regional and national case studies documenting advanced dredged material management practices provide signposts for synthesis and springboards for creative cross-disciplinary thinking. ▲海岸线类型学研究：当地的海岸类型学研究为既有场地和潜在场地的考察提供了依据，以便对巴尔的摩港的淤积物进行创新性的良性再利用。Shoreline Typology Studies. Local shoreline typology studies offer insights into existing conditions and opportunity sites for innovative and beneficial reuse of dredged material in the Baltimore Harbor. ▲适用性模型：适用性模型是一种灵活的分析工具，它能够以淤积物的弹性处理策略为出发点，整理出适宜场地的优先次序，还能够考量方案的可行性，以及水深、水底污染状况、湿地潜能和公园距离等环境和法规限制。Suitability Model. The Design with Dredge suitability model is a flexible analytical tool that prioritizes sites for sediment-based resiliency strategies; accounting for feasibility and environmental justice constraints such as bathymetry, benthic pollutants, wetlands potential, and proximity to public parkland. ▲材料测试：材料测试和实验为疏浚物料的未来潜能提供了基础和设计预测的切入点。Material Testing. 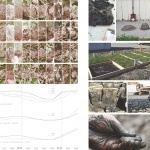 Material tests and experimentation with dredged material provides a basis for future performance, as well as an entry point for participatory action and design projection. ▲公众参与。社区的手工工作坊活动旨在改变公众对疏浚物料根深蒂固的负面看法，并恢复其作为弹性景观基础设施的地基的潜能。Participatory Action. Hands-on community workshops were scripted to engage and overcome entrenched negative perceptions of dredged material and highlight its capacity as a substrate for resilient landscape infrastructure. ▲设计预测：设计预测是一种有效的元研究方法，能够对其他调查方法产生的结果进行取样和整合，从而针对特定的空间和场地提出弹性城市景观的建设方案。Design Projection. 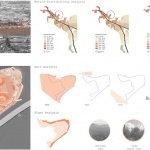 Design projection is a meta research method, sampling and synthesizing findings from other modes of inquiry to formalize spatially explicit and site specific propositions for urban resiliency. ▲设计预测还对巴尔的摩地区的合作行动起到了促进和维持的作用，为项目合作伙伴和公众提供了一块棱镜，以通过它来重新认识和构建他们与疏浚物料之间的关系。Design projection is also a mechanism to catalyze and sustain cooperative action in the Baltimore region, providing project partners and the public a prism through which to reimagine and recreate their relationship to dredged material. Baltimore and its Port are part of a complex estuarine environment where legacies of labor, innovation, and ecological justice overlap. Every year in this dynamic environment, natural and anthropogenic siltation processes infill waterways and navigation channels, necessitating the removal of 1.5 million cubic yards of sediment from the Baltimore Harbor. Perceived predominantly as a waste product by the public and regulated by layers of state and federal legislation, these clays, silts, sands, and gravels are the substrate of coastal cities. Yet, they remain literally and figuratively liminal; trapped between land and water, and largely untapped for their potential in constructing resilient landscape infrastructure. However, with rising seas, surging storms, and subsiding coasts there is an urgent national need and an acute call for action in Maryland for innovative dredged material management practices that support multi-dimensional resiliency that align with the interests of the state’s diverse group of stakeholders. The Design with Dredge research program is a direct response to this call, providing a platform for cross-disciplinary collaboration that is being led by landscape architects and includes community members, academics, regulatory and policy officials, and industry representatives proactively recasting and reimagining Baltimore Harbor sediment as a primary building block and essential resource for constructing resilient urban landscapes in the region. 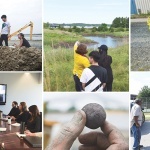 The program utilizes design as a synthesis method to integrate the most up-to-date sediment science, regulatory frameworks, economic development agendas, and community programs to develop shared conceptual frameworks, planning priorities, and applied landscape strategies for resilient dredged material management. 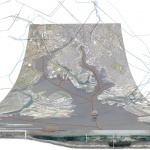 Within this context the Design with Dredge team has worked across space and time to deploy research methods that include cartographic projection, systems mapping, historical investigation, case studies, typology studies, suitability modeling, material testing, participatory action, and design projection to engage stakeholders, probe regulatory boundaries, and enhance the technical capacity of program partners in Baltimore and the Chesapeake Bay. This compound research strategy can be understood as individual research investigations with discrete findings, a toolkit of techniques for applied research, and an organizing strategy to catalyze civic action. 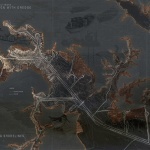 They are held together by the complex and negotiated terrain of the Baltimore Harbor landscape where histories, values, and possible futures of dredged material exist in tension, and where industrial, residential, and environmental land-uses compete for the water’s edge. In the context of this collaboration, the expertise and agency of individual partners is augmented through the exchange of knowledge and engagement with an array of inductive, abductive, and deductive research methods. 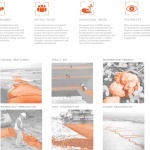 Greater than the sum of its parts, Design with Dredge is simultaneously a platform for pragmatic policy research, a vehicle for design innovation, and a mechanism to expand the field of action and actors in advocating for resilient landscapes. In Maryland, the political and legislative climate is supportive of innovative reuse and beneficial use of dredged material as outlined in Maryland’s 2001 Dredged Material Management Act, 2017 Maryland Department of Environment (MDE) Innovative Reuse and Beneficial Use Guidance Document, and 2017 Waste Reduction/Resource Recovery Plan Executive Order (01.01.2017.13) which states: “Whereas, Through source reduction, reuse, and recycling, Maryland can extend existing disposal capacity, reduce the need to construct new or expanded solid waste disposal facilities, conserve natural resources, including water and energy, increase the innovative reuse and beneficial use of dredged material, and support a productive economy through recovery of valuable resources.” However, despite the goals outlined by the state, hurdles remain to actualizing projects that reuse dredged material for enhanced coastal resiliency, flood risk reduction, habitat restoration, community recreation, and/or other civic improvements. Significant challenges include negative public perception of dredged material, incomplete information about sediment processes and material qualities, siloed planning and policy strategies, and cost implications for co-benefit projects that address multiple dimensions of resiliency. As such, each of the methods and products of the research project were tailored to investigate and articulate dredged material as an essential element in the culture, economy, and ecology of the Baltimore Harbor and Chesapeake Bay estuary, as well as a critical resource in regional resiliency and landscape infrastructure. Both qualitative and quantitative methods were used to chart variable dimensions, relationships, and potentialities of dredged material in time and space. 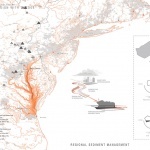 Cartographic projections, deep sections, and system mapping reveal the prevailing dig and dump mentality that has shaped and reshaped the shoreline and benthic environment of the upper and middle branches of Patapsco River in service of monolithic industrial ends. Regional sediment mapping and evaluation of existing dredged material placement capacity makes clear the need for alternative management strategies as sediment sources flowing into federal navigation channels begins to eclipse the rolling placement capacity of sediment sinks. Under these circumstances, normative landscape criteria serve as fulcrum for synthesis; integrating technical, cost, and values-based considerations into a holistic framework for collaborative and engaged action. This Design with Dredge umbrella provides the conceptual and organization vessel to work across scales and disciplinary boundaries bringing the expertise of ecologists, engineers, regulators, industry, academics, and practitioners into a deliberate mode of applied inquiry. Regional and national case studies documenting advanced dredged material management practices provide signposts for synthesis and springboards for creative cross-disciplinary thinking. Whereas, local shoreline typology studies offer insights into existing conditions and opportunity sites. Transitioning from insight to action, the project’s suitability model is a flexible analytical tool that prioritizes sites for sediment-based resiliency strategies; accounting for feasibility and environmental justice constraints such as bathymetry, benthic pollutants, wetlands potential, and proximity to public parkland. Material tests and experimentation with dredged material provides a basis for future performance, as well as an entry point for participatory action and design projection. However, they do not attempt to prove statistical significance or guarantee results. Rather, they serve as specific analogs for one-to-one design exploration that establish a meaningful dialogue between existing conditions and future possibilities. Moreover, they communicate an engaged and cross-disciplinary methodology that is digestible by experts and public stakeholders alike. 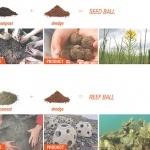 This multilingualism is central to the Design with Dredge research program, which attempts to overcome both entrenched negative perceptions of dredged material and recover its capacity as a substrate for resilient landscape infrastructure. To that end, material studies guide participatory action, which take shape as hands-on community workshops to create seed balls and reef balls that incorporate dredged material with other ingredients such as compost and native meadow mixes or oyster shells and cement for restoration of terrestrial or aquatic habitat respectively. 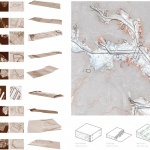 Design projection is an operative meta-research method, sampling and synthesizing findings from other modes of inquiry to formalize spatially explicit and site specific propositions for urban resiliency. Perhaps more importantly, it is also a mechanism to catalyze and sustain cooperative action in the Baltimore region, providing project partners and the public a prism through which to reimagine and recreate their relationship to dredged material. The Design with Dredge research program represents an ongoing effort to recast and restore urban sediment as an essential component of resilient urban infrastructures. 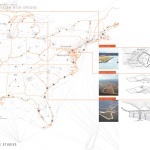 As a collaborative and interdisciplinary undertaking, the project attempts to describe the complexity and interconnectedness of anthropogenic and natural siltation processes, as well as to catalyze specific action in the Baltimore-Chesapeake region. 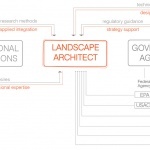 This approach embraces the methods and knowledge of descriptive science and the normative agency of design research. 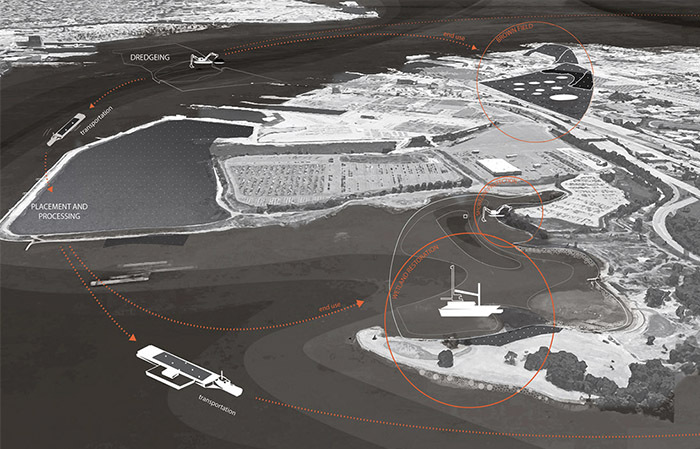 In contextualizing dredged material beyond the logistical, industrial, and mechanistic, the program aims to literally and figuratively create new ground for estuarine cities upon which to grow socially, culturally, ecologically, and economically vibrant communities. By doing so, we maintain the hope expressed by the philosopher John Dewey that ‘The designs of living are widened and enriched. Fulfilment is more massive and subtly shaded.